Don’t be scared, be informed! 🙂 The tabloids have been having a field day with Giant hogweed over the last few weeks, and due to the danger it poses; for once I think they aren’t far from the mark. A little knowledge and some respect for the plant should keep you and your loved ones safe. So here’s what we know about it. Giant Hogweed is a notoriously dangerous plant which though uncommon in the UK is something you are likely to see if you spend a lot of time walking beside rivers and streams. That is its habitat; you will rarely find it far from a fresh water source. 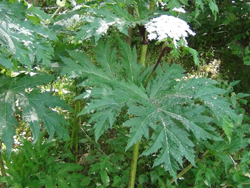 The danger with Giant Hogweed is not poisoning, but in the way that its sap reacts with your skin. If you get the sap on you then it will react with the melanin in your skin, and removes any protection that patch has from UV light. If the hairs or sap come into contact with your eyes they can cause blindness! The furocumarins that cause this effect are present in all parts of the plant. This means that if you get it on your skin and your skin in the sun you will burn severely. The sap does not stop there though; it actually genetically alters that patch of skin so that all skin produced there for up to 7 years will have little protection from the sun. 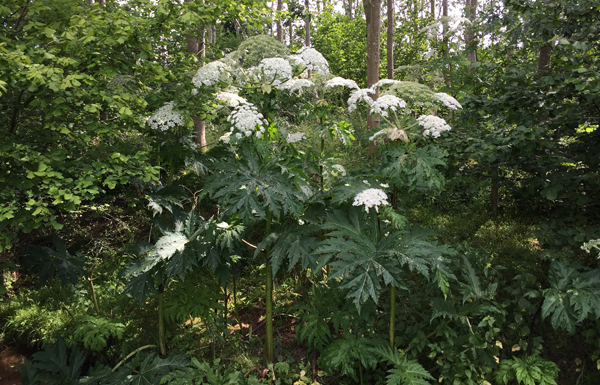 Many plants including parsnips and common hogweed contain phototoxic sap, but none in the UK are anywhere near as severe as that of giant hogweed, though on sunny days we recommend harvesting common hogweed or even parsnips with gloves on. With Giant Hogweed you don’t have to break the plant and rub the sap on you for the effect to take place either. The stems have fine needle like hairs that will cause irritation simply by touching it. So the rule is just stay away from the plant if you see it. DEFRA are trying to eradicate the plant from the UK as it is a non native species. It was first introduced by the Victorians due to its majestic size, huge flowers and pre-historic looking leaves. It originated in the Caucasus Mountains in Southern Russia and around Georgia. 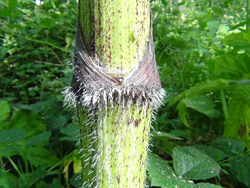 Giant Hogweed is mainly a danger for children who may well use the long stems to play with as swords, pea shooters or telescopes. Walkers who may brush against it, or gardeners who may unwittingly strim the plant getting the sap on themselves. 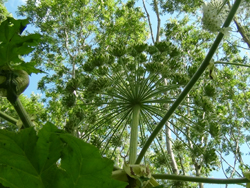 Giant hogweed can grow to more than 4 metres tall, with flower umbels that can reach 2 feet in diameter. The numerous flower umbels on each flower stalk can measure metres in diameter altogether. Size is one of your key identifiers here. 3 metres beside fresh water sources. There are other key differences too. 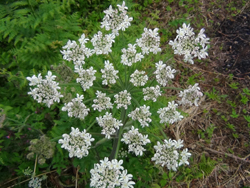 Common hogweed seems to prefer roadsides to riversides, but it will grow almost anywhere. 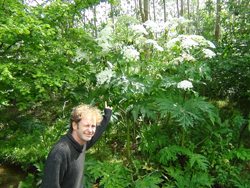 Giant Hogweed is almost exclusively a riverside plant. more than 2 metres tall. The leaves of Giant Hogweed are larger, shinier, more sharply serrated and more importantly, hairless. 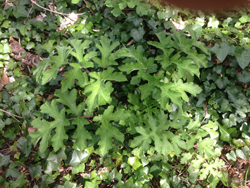 with very serrated leaves too. Safe identification of Common Hogweed is essential, but once you know both plants mistakes are hard to make. 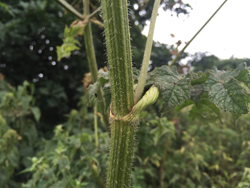 Caution when harvesting hogweed, e.g. protecting your skin and wearing gloves is still recommended though. 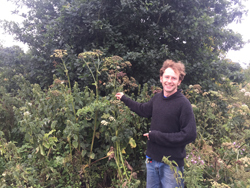 Common Hogweed really is one of our favourite edibles so we highly recommend you try it, and we hope this article and videos keep you safe when you do :). 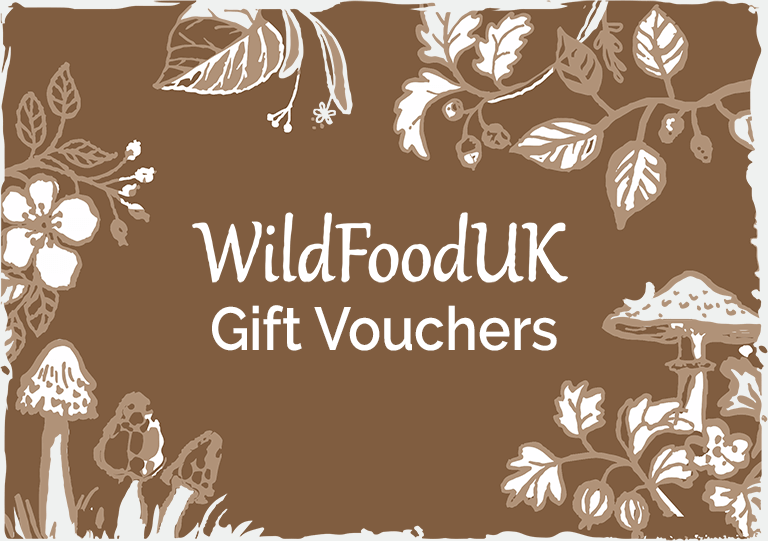 More details on both plants can be found in our Hedgerow Food Guide.